Hearts retained the East of Scotland Shield with a 2-1 victory over Hibs at Easter Road. Second-half goals from Euan Henderson and Anthony McDonald gave Hearts Under-18s a two-goal cushion before Jamie Gullan’s penalty reduced the deficit, although the visitors held on to claim the Shield for a second successive year. Kelby Mason in the Hearts goal was their designated overage player, and he was the first of either keeper to be called in to action. He gathered a header from Ryan Porteous after the defender, on-loan to Edinburgh City, stole a march with a late run at a corner. Captain Alex Petkov was first to register an attempt for Hearts, but the recent Bulgaria Under-19s call-up dragged his shot wide of Patrick Martin’s right-hand post. Calum Morrison then found the target after nice control by Andy Irving, but Martin was bale to gather low. That was about it for the first half in terms of attacking action, although Jon Daly’s team perhaps felt the whistle came too soon with the Wee Jambos controlling proceedings. It was the hosts who began the second 45 on the front foot however, with Fraser Murray inches away from opening the scoring within a minute, his snap-shot pinging off the crossbar with Mason beaten. Hibs were controlling possession before Hearts typically scored with their first attack of the half. Aaron Reid’s delivery was met firmly by Irving. His initial shot was blocked but fell nicely for Henderson, who showed good composure to slide the ball past Martin. Some fine link-up play down the right between McDonald and Marc Leonard gave the former a sight of goal, and his curled left-foot effort drifted not too far wide of the far post. McDonald then duly doubled the lead with 15 minutes remaining. Jack Gillan picked out his run with a through ball, and the wide man took it in his stride before giving Martin the eyes and finishing high in to the net in front of the empty South Stand. Hibs were then handed a lifeline immediately when Petkov was adjudged to have fouled Gullan by referee George Calder. 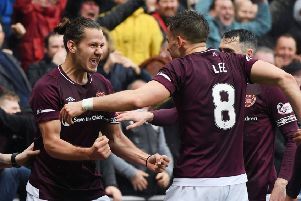 Hearts aggressively protested what they felt was a soft award, but Gullan fired the spot kick past Mason to set up an interesting last ten minutes. Gullan looked Hibs’ best bet for an equaliser, but his ambitious attempt to catch Mason off his line after a swift counter-attack sailed over the bar, along with his side’s chances of forcing a penalty shoot-out. Hibs: Martin, Donaldson, Hall, O’Conner, Porteous, Smith, Walker, Campbell, Gullan, Murray, Gallantes (Shanley 74). Hearts: Mason, Morrison, Reid, Hamilton, Smith, Gillan, McDonald, Petrov, Leonard (Ritchie 90), Irving, Hendeson.